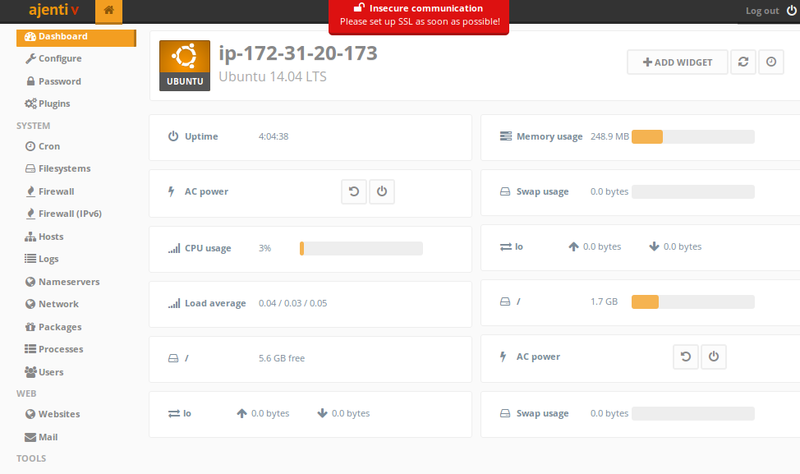 When we are using VPS, it’s better if we install a hosting control panel. It’s very important choosing the better control panel. Cause i don’t like most of the control panel like webmin, zpanel. It’s has less feature. now a days i like Ajenti control panel. Really very nice control panel. Thought it has some problem. But it’s good to work. 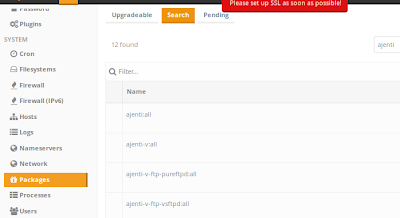 This will install ajenti-v, nginx, mysql and php. In this part you have to input mysql password. Now again restart the service. we will login on our hosting control panel. To login you have to write https://id-address:8000. I mean if your ip address is 54.191.216.168. You have to write https://54.191.216.168:8000 and check on the browser. You will get a warning. Ignore it and click on the include this exceptional. You will get this login page. Input root as user name and input admin as password. On the left side go to the package । click on the search tab. write ajenti on the search box. You will get this. click check mark on these packages and appy. Automatically all package will be installed. If it want any permission click on the Y. Here on the left side, go to the “websites”. Click on the restart websites. Carefully check is Nginx service on or not. If not no problem. Suppose on the new website part you have written mashpy.me and click on the create button. Click on the manage. uncheck the maintance mood. on the path write /srv/mashpy.me/domain and click on the create director. click on Set and apply changes. Please do the all task carefully. Go to the Content and select php-fast-cgi. Then create and apply changes. ### Those who are using Joomla or wordpress site which is depended CMS. They will fall routing problem. To solve this problem check the simple file. Just put it on the web site configuration option. on this page you will get the code. Please write it carefully as you need. There is a Mysql tab, you can go there and create database and user. Don’t forget to click on the grant all permission. On the FTP part you will see, user is created automatically. You can check ftp details using filezilla. Sometime you may fall a problem. In that case select passive mode on your filezilla. Sometimes you may see different types of error in your website. In that case click on the “websites” on ajenti control panel. click restart website. nginx will start. If not please restart again. If not now login on your server using ssh. Then click restart website and hope nginx will run this time. 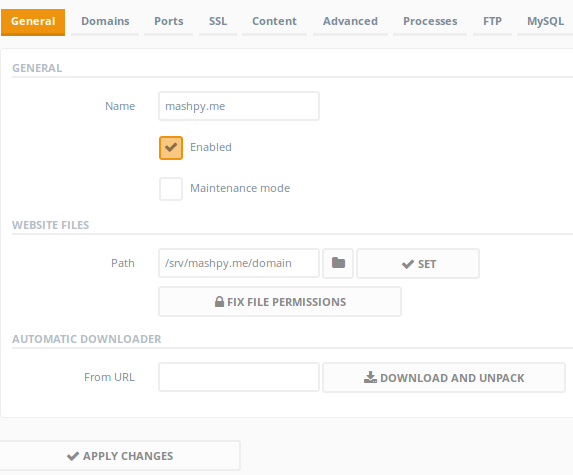 Go to this location srv/mashpy.me/domain using file manager and create a new file. Rename it to index.php. Edit it and write <?php phpinfo() ; ?> and save it. 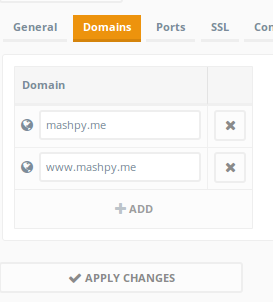 Now go to the mashpy.me site. Can u see anything? No ! we have to configure DNS on domain control panel. Domain and hosting connected with 2 ways. First is using name server and second is using DNS. If your domain provider is Namecheck or Godaddy, then login on that and select the DNS. You will not get as like as this what i say. Please search on the google how to edit DNS for your domain provider. For domain configure like this. TTL value will 600. Save it. 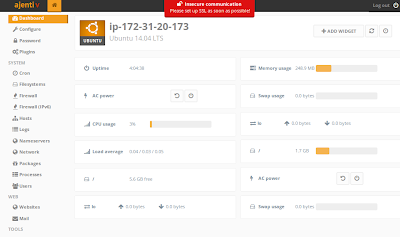 After 12 hours you can check your site what is the output. But i am not wait for 12 hours. I go to the https://www.hidemyass.com/proxy or http://snapito.com/ to check my site after changing the DNS. Now i will teach you how to configure subdomain. Suppose you want a subdomain name bookmark. Add like this on you domain control panel. 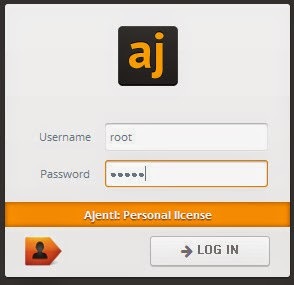 On the ajenti control panel on websites, Also Change the general path srv/mashpy.me/bookmark . 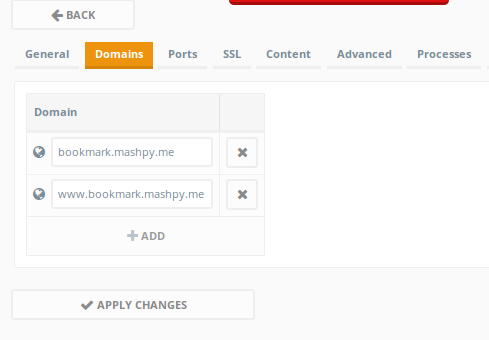 Create a new site name “bookmark.mashpy.me”. on the domain tab write – bookmark.mashpy.me and www.bookmark.mashpy.me . Now put a index.php file on srv/mashpy.me/bookmark. Check your site ok or not. Sometimes you need to install phpmyadmin. You can create a subdomain called phpmyadmin and put the script of phpmyadmin downloading from their site. Then after browsing phpmyadmin.example.com you can do all work. There is a new article on ajenti domentation on phpmyadmin. You can check. To configure the mail go to the main option. Create a new mail box prefix. You can click on the mailbox or forwand it to you another email address. I think on ajenti forwarding is the best choose. Limitation 1: Ajenti support the latest version. If you want to use multiple version, I don’t know how to do this. I Tried a lot to do that. Cause I have some sites, which works well in old version. 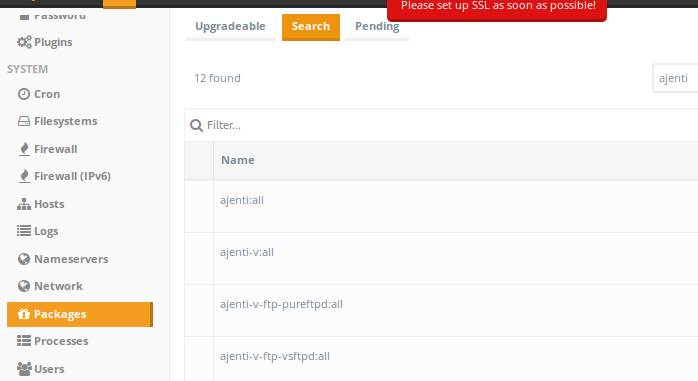 As ajenti does not support the old version of php, so I can not run my sites. Limitation 2: When we add sudomain, then we need to update the IP address on domain control panel. If we use bind9 for nameserver, no need to update DNS every time. But i am failed to configure the bind9. Please read the article minimum 3 times to understand. If you face any problem don’t hasitate to comment here. Aj web hosting panel is amazing. It has utmost great features. Dominios is also providing such wonderful features in cheap rates. Although the list of cloud hosting service benefits is long, it is imperative to choose the right cloud hosting service provider because the selection of wrong provider may invite negative outcomes. One Of the Best Sever admin panel . This article help me a lot .